Lucky bamboo plants can develop yellow leaves or yellow stalks for a number of reasons. The key to saving a plant when the yellow appears is to assess the cause and take action to restore the plant to health. There are four possible causes for a lucky bamboo turning yellow outside of disease: water, light, fertilizer, or temperature. One of the first culprits to investigate for yellowing leaves or stalk is the water. Typically, lucky bamboo plants are kept in a vase of water with a substrate, like rocks, but some are grown in soil containers. The source of water is an important consideration for the care of your plant. You never want to use tap water for your Lucky Bamboo plant. This will set up failure before you start since tap water contains chemicals, such as chlorine and fluoride, that can be harmful to plants. Consistent exposure to the chemicals in the water can lead to your lucky bamboo plant dying. Break out a bottle of distilled water or spring water for your bamboo. 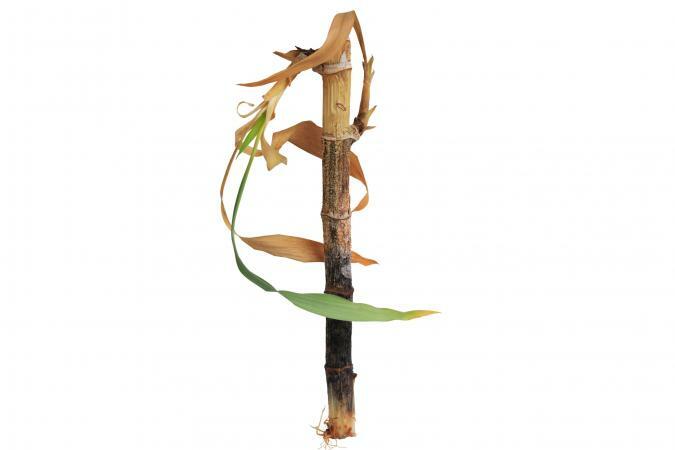 If you have a garden and use a rain collecting system, you can also use that water for your lucky bamboo plant. Just make sure the water isn't traveling over an asphalt roof since chemicals could be in the run off. Lucky Bamboo Shop even gives the green light to aquarium water since it contains the beneficial fertilizer produced by fish waste. Use water that is room temperature. The measure of health for a lucky bamboo plant can be as simple as fresh water. Lucky Bamboo Shop recommends (for plants in water) exchanging old water with fresh water. The fresh water is vital to healthy plant life since it provides nourishment with nitrogen and oxygen. In addition, fresh water contains trace elements that the plant needs. Change the water every two weeks for best results. Avoid stagnant water (a feng shui no-no). Old water sets up various conditions for bacteria, fungus, and especially mold. Change the water immediately if it turns dark, murky, cloudy, green, black, or smells foul. The Flower Shop Network suggests keeping the water level around two inches. You want to ensure that you have enough water to cover the roots. Consistency is key to maintaining a healthy plant, so be sure you have a consistent water level. If your plant is in soil, add rocks on top of the soil to prevent soil displacement when you water. The soil should be maintained at a moderate moistness. The rule of thumb for testing if your in-soil plant needs watering is to stick your forefinger into the soil up to the first joint (1"). If the soil feels dry, then it's time to water. Be careful not to overwater and that the plant container has good drainage. Since the plant is in a soil bed, you'll need to mist the leaves every two or three days to maintain a healthy plant. If the leaves on your plant appear to have turned yellow as though burned, the cause is most likely direct sunlight. The lucky bamboo cannot live in direct sunlight, but thrives in bright indirect light. If your plant is receiving direct sunlight, then you need to move it. By the same token, too little indirect light can make your plant become weak and its color will turn yellow or pale. One of the popular locations for lucky bamboo is on a kitchen counter near a window or on a table by a window. You want to make sure that the plant doesn't receive direct sunlight. The hot direct sunlight will basically burn the plant since its natural habitat is under the lush foliage of a rain forest. 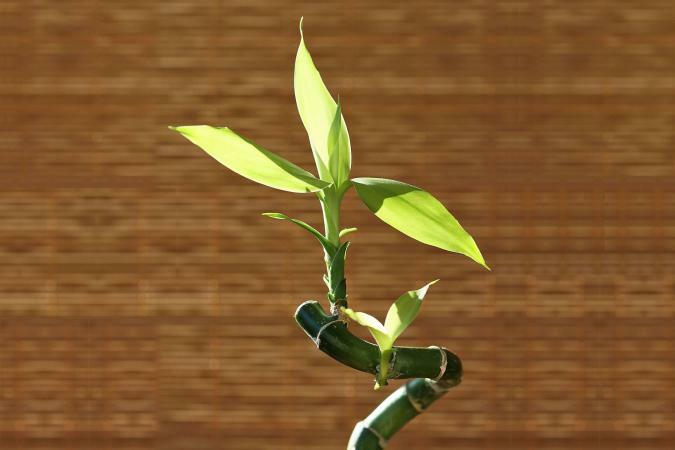 The best feng shui locations for a lucky bamboo plant are the East and Southeast (wood) sectors. If you need to activate the South sector of your home, then a wood element will fuel that element. Be sure whichever sector you use that your plant receives only indirect light. Yellowing of the lucky bamboo stalk is almost always the result of over-fertilizing. If your plant has both leaf and stalk yellowing, the first thing to consider is over-fertilizing. 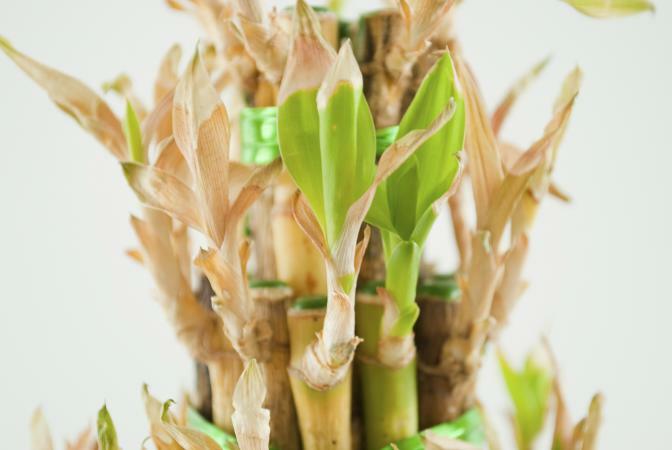 This is often a mistake owners make, not realizing that most lucky bamboo plants don't require fertilizing and can thrive for years and years without ever being fertilized. If you must fertilize your plant, then make sure to use one specifically for lucky bamboo. Such a feeding should be a rare and infrequent dosing. For in-water plants, the solution for lucky bamboo leaves turning yellow is to immediately change the water. This can work in some cases where the plant hasn't soaked up too much fertilizer to kill it. However, in other cases, it might be too late to save the plant. This is especially true if it's the stalk turning yellow instead of just the leaves. The best approach for an over fertilized in-soil plant is to repot with fresh soil that doesn't have any added fertilizer. The damage may have already been done, and the plant absorbed too much fertilizer. You'll know within a few days if your plant will survive. If your lucky bamboo leaves are turning yellow and you've ruled out all the above possible causes, then it could as simple as too cool a temperature. The plant thrives best in temperatures between 65°F and 90°F. A low humidity environment is problematic. Remember, the plant's natural environment is that of a very humid rainforest. Since the lucky bamboo prefers a humid climate, you may need to remedy a dry one by misting the leaves every two to three days. This will give the plant and leaves the high moisture it craves. This should stop the plant from turning yellow if low humidity is the cause. If you've tried all the recommendations and your plant is still on a decline with yellow leaves and stalk, it may be time for drastic last-ditch efforts. You can salvage your plant. Never throw it away without first trying one of the two propagation methods for salvaging what is typically an expensive plant. If your plant has a few yellow leaves, then you can snip them with a pair of scissors. This is especially necessary if your plant is suffering from too much water or direct light. Better to remove them so new leaves can grow. However, if your lucky bamboo stalk is dying, then you have only one recourse, and that's to cut the green sprouts and root. Snip leaves below the growth node that protrudes from the stalk to keep intact. This is where new roots will form. Dip the cut end of the sprout in a planting hormone to encourage root growth. Fill a vase with water to hold the sprout(s) and allow them to grow roots. 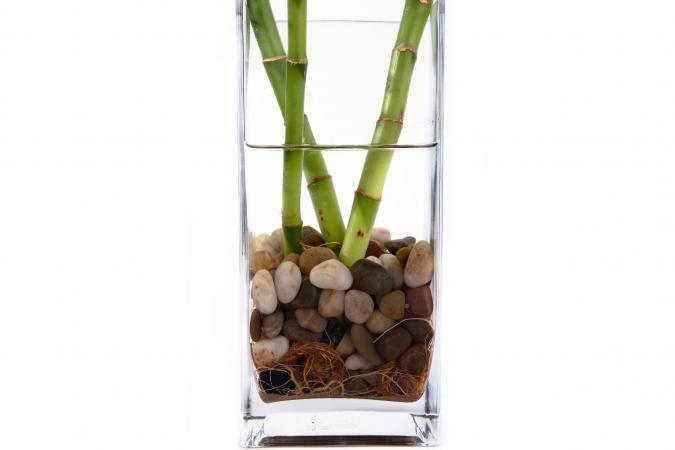 Once there are plenty of roots, you can transplant the new lucky bamboo either into a water or soil-filled vase. If the roots are still good but the upper part of the stalk is yellow, you can possibly salvage it. The first thing to check when a plant begins to turn yellow is the root system. You can quickly assess its health by examining the roots. The color of healthy roots are reddish or orange. Diseased roots are brown, black, or gray and need to be removed by cutting off where they protrude from the stalk. Cut off the yellow part along the line where green is still showing. Once the stalk is cut, it typically stops growing in height/length but will develop new sprouts that will grow vertically. Seal the cut part of the stalk with candle wax to prevent rotting and disease. Place the stalk either in water or in soil and care for it. If the stalk continues to turn yellow and no new sprouts develop, the plant can't be salvaged. It's time to discard and buy a new plant. You can continue your original number of stalks to keep your chosen feng shui number. When your bamboo stalk looks like the one below, it's likely dying and you will need to replace it. 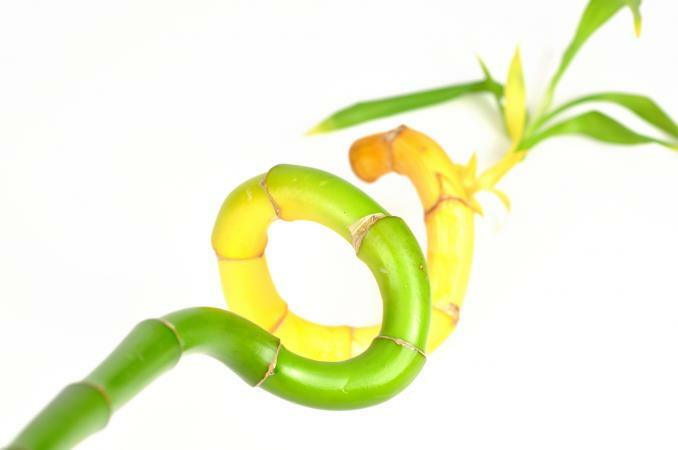 There are many things you can do to remedy a yellowing lucky bamboo plant and make it beautiful again. Once the cause has been identified, you can take specific steps to bring your plant back to life. Don't throw away your lucky bamboo until you've assessed it cannot be salvaged.